The Gabii Project is an international archaeological initiative under the direction of Nicola Terrenato of the University of Michigan. It was launched in 2007 with the objective of studying and excavating the ancient Latin city of Gabii, a city-state that was both a neighbor of, and a rival to, Rome in the first millennium BC. Located in the region of Italy once known as Latium, the site of Gabii was occupied since at least the tenth century BC until its decline in the second and third centuries AD. Amazingly, in subsequent centuries the site of Gabii was never developed or even substantially occupied, nor has the urban area ever been the site of major, stratigraphic excavations. 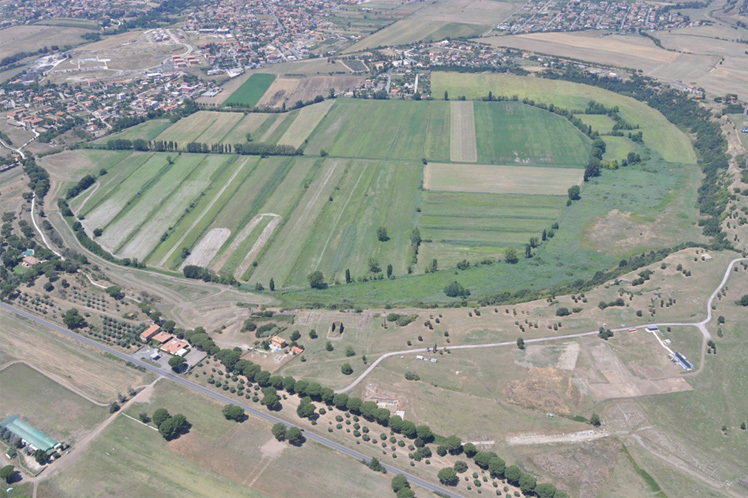 As such, the site provides a unique opportunity to study the development and structure of Archaic urban planning in Central Italy, both monumental and civic architecture, domestic space, and all other corollary studies. Since Gabii eventually became a part of the Roman Empire – first as a member of the Latin League and later as a town with municipal status – numerous important intersections exist between Gabii and Rome. This awareness of the linkages between Gabii and Rome is but one motivation for further archaeological investigation of this urban center. The Gabii Project seeks not only to explore and understand the archaeology of the city of Gabii but also to situate and contextualize our understanding of Gabii in the wider orbits of Central Italy and the Roman Empire. It is also important to achieve a better understanding of the urban development of Gabii herself and the relationship that existed among the cities of Latium in antiquity. The field research of the Gabii Project began with a geophysical survey of ca. 40 hectares of Gabii’s urban center in 2007 and 2008. After the 2007 season, initial findings encouraged a full-scale magnetometry survey of the urban area and this was completed by autumn 2008. The initial findings presented evidence of a previously unknown urban grid within the line of Gabii’s ancient walls, and it was on this basis that major excavations commenced in June 2009. In July 2011 the Gabii Project received a collaborative research grant from the National Endowment for the Humanities for the period 2012-2014 (read more). The initial phase of excavations continued in 2014 and 2015.